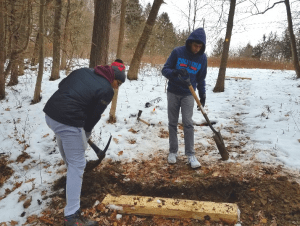 Over the last several months Westford Boy Scouts have exemplified Scout laws of “Loyal, Helpful and Friendly” by completing several remarkable projects on Westford Conservation Trust property. These challenging projects have contributed to Westford’s trail system along with improvements which will have long term effects protecting our fragile woodlands and environment. We thank Westford Scouts for their commitment to our community and country. 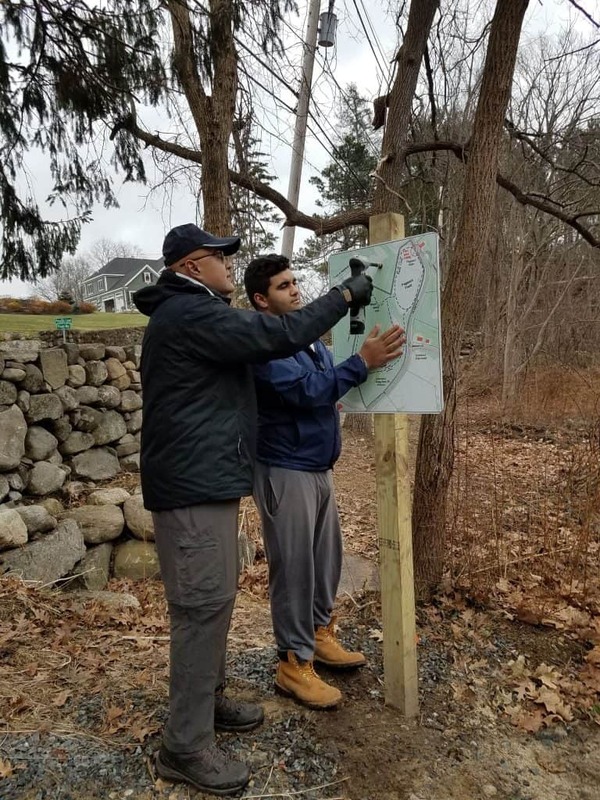 The Westford Conservation Trust’s Prospect Hill Wildlife Pollinator Sanctuary on Hildreth Street was in need of a trail to both provide access to Prospect Hill and to provide a loop trail around Pageant field. The new trail needed to provide access from the trailhead at the lower entrance gate where there is parking and easier entrance. This project was planned in accordance with the AMC (Appalachian Mountain Club) Complete Guide to Trail Building. 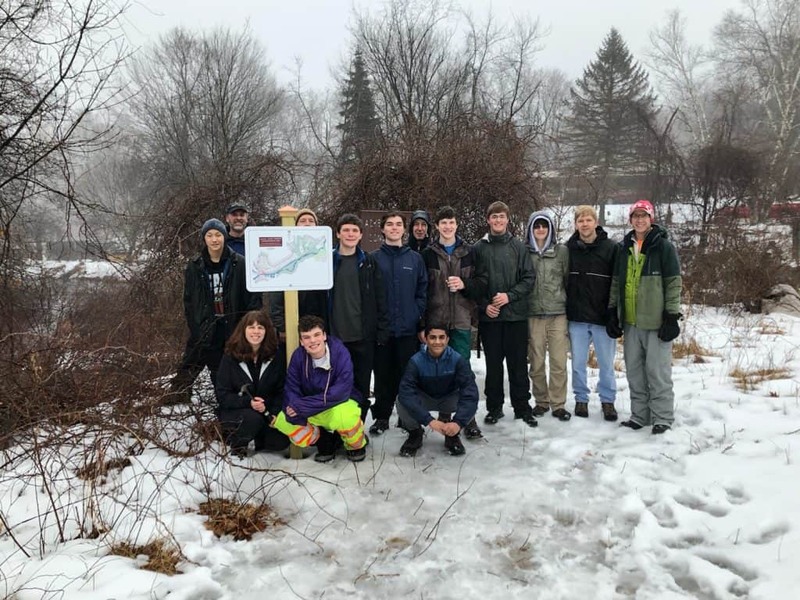 Once reviewed and approved by the Westford Conservation Trust Board, Scout Anish Venkatesh led his team of five Scouts from Troop 195 to complete the project before the winter freeze in January. Creating a trail from the lower gate and a new loop trail around Pageant field required removing encroaching brush on the perimeter of the field. The path along the newly repaired stone wall required redirecting water draining from Hildreth Street. Water bars were installed to enable drainage to an established waterway. 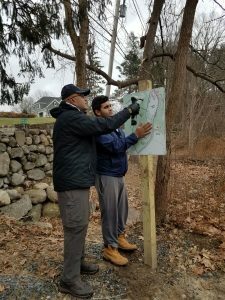 Westford Conservation Trust provided two new trail map signs that were installed by the Scouts. The project began in November 2018 and was successfully completed in December. 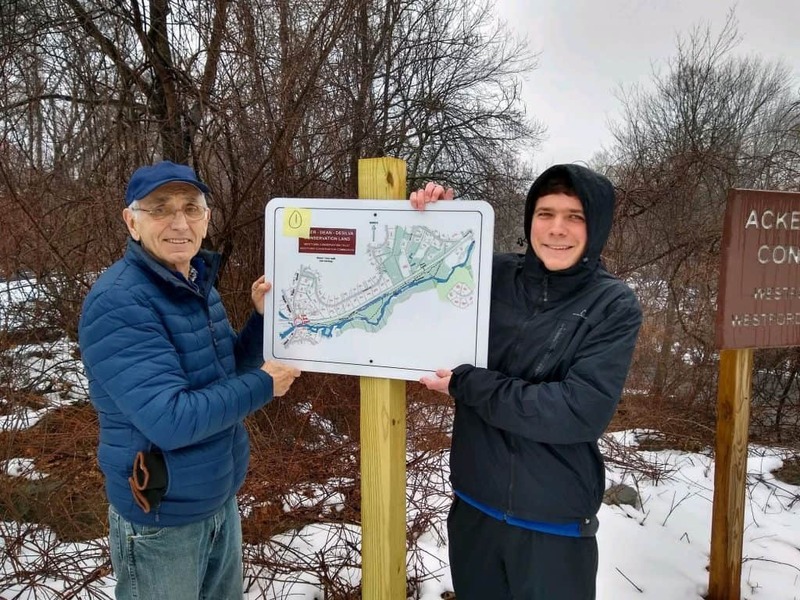 The new Pageant Field Loop Trail is now blazed and connected to the Prospect Hill Trail. The Westford Conservation Trust Properties of Hildreth Meadows and Pageant Field needed help in our battle against the dreaded Lymantria dispar, better known as the Gypsy Moth Caterpillar. Many of us still remember the Gypsy Moth infestation that defoliated many Massachusetts forests in 1981. Starting in 2015 there was a resurgence in the population of the Gypsy Moth in Massachusetts leading to over 923,000 acres of defoliation in 2017. The Massachusetts Department of Conservation and Recreation is expecting the outbreak to continue in 2019. Eagle Scout Elliot Coleman of Troop 195 built 12 bird houses and 12 bat boxes to help manage this destructive moth species. Installing the artificial bird habitats proved challenging in the frozen ground of both Pageant Field and Hildreth Meadows during the late winter snowstorms and freezing temperatures this winter. The bat boxes are being installed in trees along the perimeter of each field. Box locations were identified with the help of Trust member Lenny Palmer during an exploratory visit of both field ecosystems. 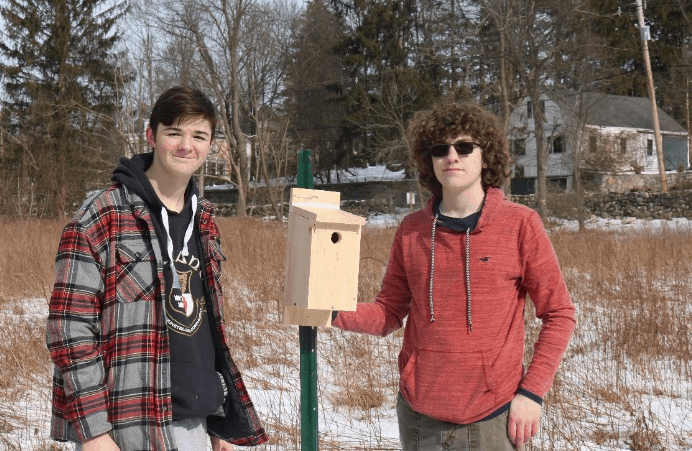 Elliot’s proposal to build both bat boxes and bird houses provides both day and night control over the destructive invasive species. Elliot’s research uncovered an interesting finding. The recent string of warmer summers has caused the introduction of the fungus Entomophaga Maimaiga to become less effective in the control of the Gypsy moth larva. Massachusetts state agencies presently rely on nature to manage Gypsy Moth populations. The Westford Conservation Trust Acker-DeSilva-Dean property is nestled between Stony Brook and the railroad tracks that run through Westford on Depot Street. You need to look carefully for the trail sign. Board members of The Trust discovered a foot bridge needed to be removed and replaced during a visit last year. 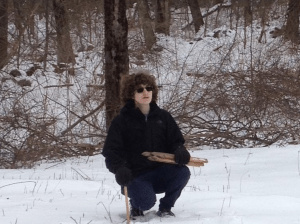 Eagle Scout Spencer Purple took the initiative and led a team of Scouts from troop 159 to dismantle and remove the decaying foot bridge. After a few months of planning and obtaining approvals, Spencer and his team started January 6th and worked through the last weekend in February. They removed the foot bridge first and then cleared brush and cleaned the trails. The Acker-DeSilva-Dean Trail needed Trailhead maps and the trails needed trail markers (blazes) to meet AMC trail standards. With the assistance of Ron Gemma and Bill Harman, Troop 159 Scouts installed trailhead maps and yellow blazes along the trails. This Scout project brought the trail to the standards of the AMC. You can see the results of this project and enjoy the view of Stony Brook and our feathered friends during their spring migration north. The next time you cross the bridge on Depot Street, park your car at the Stony Brook Conservation Land sign. Cross the street, walk down the right-side edge of the railroad bed next to the farm stand and you will see the entrance to the Acker-DeSilva-Dean Conservation Trust property.